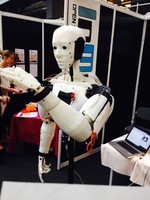 Richard Smith, of Igloo in Education and Amazing ICT, recently visited the 3D Print Show in London. What did he make of it? Hi, Richard Smith here from Igloo in Education. I am delighted to have been asked by Terry to do a guest blog post on the 3D print show that took place in London from 7-9th November. Over the past few years I've written several articles about 3D printing and its potential application in education. I first came across a 3D printer at a City Learning Centre in London. That was 15 years ago at the time of writing, ie 1998. What I had not realised back then was that 3D printing had already been around for ages -- since the mid-1980s in fact. Unless you’ve been walking around with a bucket over your head for the past year or three, you must have noticed that 3D is definitely the “in” thing. It’s almost de rigueur for new movies to be in 3D, and there is even at least one smartphone which has a 3D display. But what about educational applications?